One of the best things about the motorcycle community is that there’s no shortage of great people doing great things — whether that’s working on an inventive new build, starting a new event or group, or launching a new company. 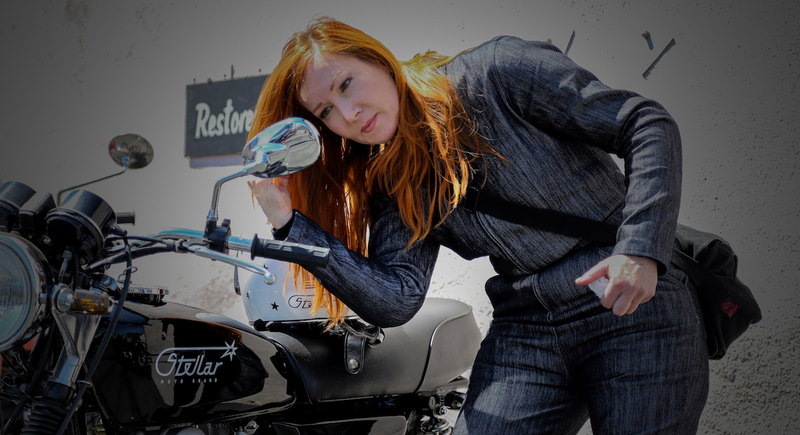 And I especially love spreading the word about quality, protective motorcycle gear for women, so I knew within minutes of meeting Jenna Stellar of Stellar Moto that I wanted to have her on the blog. I caught up with Jenna on Skype a couple of weeks ago — right before her first products launched — to chat about her business and background, and to nerd out about motorcycle gear. Jenna is a warm, enthusiastic person with an infectious passion for her work that shines through even on grainy Skype video. She told me that Stellar Moto and her flagship product, an abrasion-resistant jumpsuit, have been fifteen years in the making, all the way back to the years she spent designing motocross-inspired clothes at fashion design school. Even though Jenna loved the entertainment industry, her desire to start her own line of motorcycle gear was never far from her thoughts. “I was doing custom motorcycle leather jackets for customers here and there, and it was just my hobby, but I kept on wanting to make it my life,” she said. Every few years she would make another attempt to launch her brand, but something always came up. It wasn’t until she had a motorcycle accident that put her on crutches that she decided it was time to put her full energy into making her dream a reality. When I went down on my bike, it was like, why am I not really protecting myself from the waist down? With her time off, she delved into researching what it would take to make her dream gear. Jenna has always been drawn to wearing jumpsuits, so she wanted to make one with abrasion-resistance and appropriate armor that was — above all — comfortable. I’m a little wuss about that kind of stuff. I don’t like being uncomfortable, I don’t like the heat. It’s really hard to get people comfortable in hot weather, so I’m focusing on that a lot. That’s when she discovered Dyneema, the brand name of a synthetic fiber called UHMwPE, or Ultra High Molecular weight Polyethylene. Dyneeema is used in several high-risk industries like offshore drilling, military, and law enforcement, and it’s quickly becoming a new standard for motorcycle gear. Not only is it extremely strong (15 times stronger than steel), but it can be woven to create durable single-layer fabrics — as opposed to Kevlar, which can only be used as a secondary layer. After doing some research, I can vouch for Jenna and say that Dyneema denim truly is a great summertime fabric, and a solid protective fiber all-around. Dyneema is the lightest super-fiber available, it doesn’t lose its strength if it’s bent or folded, it’s water-resistant, and it conducts heat much better than Kevlar — which means it pulls heat away from your body instead of trapping it in. As Jenna likes to say, this stuff really does feel like space-age technology. While Jenna was researching gear and protective technology for her line, she was shocked to discover how much of the motorcycle gear on the market wasn’t actually CE-rated or protective at all. They make it look ‘moto’ without putting actual protective technology into it. And that drives me nuts. They charge so much for stuff that is really just designer clothes with a pocket for armor. Can I get an amen? Everywhere I look, I see another pair of jeans, another jacket, another pair of shoes marketed as motorcycle gear, but lacks true protection. Don’t get me wrong — riders should of course be able to decide what level of protection they are comfortable with while riding. Since Jenna has been in the motorcycle industry her whole life, she’s been able to watch the motorcycle community change and develop. And, according to Jenna, her favorite part is the diversity that has come to the motorcycle industry in recent years. What I love more than anything is that it doesn’t feel as exclusive anymore. You don’t have to be just this one type of rider. Which makes it to me, more fun. Jenna said that this diversity has been one of the key drivers for the design choices that she’s made with her new line. It’s important to Jenna, however, to retain some of the “old-school-cool” motorcycle aesthetic, since vintage motorcycle gear has been one of the last types of gear to see any real technological advances. “Race bikes have tons of protective choices, and adventure already has lots of cool gear technology,” she said. Jenna’s gear, on the other hand, could aesthetically “work” whether you’re riding a Ducati, a Sportster, or a custom 1980 KZ440 😉 — while still providing a high level of protection. Jenna has also taken a mix-and-match approach to gearing up. Her jumpsuit has pockets for armor, as will her leather jackets, but you can also buy a set of her mesh armored shirt and leggings and wear those under gear you already own. Jenna’s online store officially began selling her flagship products last week, but she kept dropping hints to let me know that she has much more up her (armored and abrasion-resistant) sleeves. And I’d say, based on Jenna’s first products and her commitment to truly functional, protective gear, this is definitely a company to keep an eye on. Not to detract from the achievements of Jenna, but is the interview with by Sofi/ Moto lady available? *the interview with you. Sorry.